We are involved with the manufacturing and supplying of best quality Fiber Classifiers. These Fiber Classifiers provided by us are made out of high grade raw materials to ensure high performance and long term usage. These Fiber Classifiers are tested by experts under strict industry parameters. Fiber Classifier (Screen Frame) is meant for investigating the fiber length distribution in pulp. Each unit provided with an electric motor for driving the rotor and is fully self-contained. All units easily combined in cascade mode. The screen frames are clamp spring loaded clamping systems fitted with interchangeable screen as per applicable reference standard. 10, 20, 28, 48, 100, 150 & 200 & other mesh size. 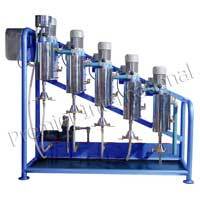 Fiber Classifier (SS Frame) is meant for investigating the fiber length distribution in pulp. Each unit provided with an electric motor and gear box for driving the rotor and is fully self-contained. All units easily combined in cascade mode and mounted on steel frame with complete vacuum pump and water filling control. The screen frames are clamp with spring loaded self clamping systems. Vacuum cups with vacuum pump and control valve. Fiber Classifier (SS Frame) has Liquid level flow control and alarm system and sequence control timer with control panel. 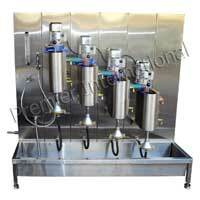 Complete equipment is mounted on a stainless steel frame structure complete with all control panel and necessary pump.